In Rome there was no doctrine as such, no holy book and hardly even what we would call a belief system. Romans knew the gods existed; they did not believe in them in the internalized sense familiar from most modern world religions. Nor was ancient Roman religion particularly concerned with personal salvation or morality. Instead it focused more on the performance of rituals that were intended to keep the relationship between Rome and the gods in good order, and to insure Roman success and prosperity. The sacrifice of animals was a central element in most of these rituals, which otherwise were extraordinarily varied…. In general, it was a religion of doing, not believing (pp. 102-103). Two interesting points to consider: (1) We do not even have the modern Western concept of religion as personal faith until the rise of Judaism and Christianity; and (2) Given this spiritual environment, we can see how the early Christian movement was so appealing to many when, in the providence of God, it broke onto the scene in the first century. The modern concept of personal faith was not endorsed by the Roman Government but it was widespread throughout the world, including Rome. The mystery religions were all about it. The first specialist after tge natural sexes, is the shaman, or witch doctor and they are very personal in their faith. Have not read the author but the conclusion is very in fashion and wrong. Clearly there's always at least a minority that have a personal faith. JRR, thanks for the comment. 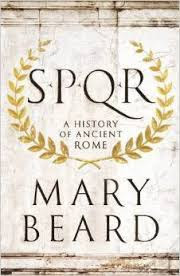 Beard is a classics scholar so I think her knowledge of the Roman world (including its religious views and practices) is reliable. I have read similar conclusions on Roman religion in academic historians of early Christianity like Robert Louis Wilkin (see his book The Christians as the Romans Saw Them, Yale University Press), Bart Ehrman [hardly a Christian ally], Larry Hurtado, etc. As for the mystery religions, I'd suggest reading Ronald H. Nash's The Gospel and the Greeks: Did the NT Borrow from Pagan Thought?, P&R. He makes the point that the mystery religions were late and actually influenced by Christianity (rather than the reverse). As for the "shaman" and "witch doctor" reference, I assume you are talking about religious traditions outside the Greco-Roman world, which would be irrelevant to the point made here.